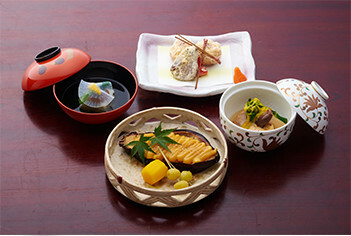 Enjoying dinner in true traditional Japanese style will be the most memorable part of staying at a Ryokan. We offer luxurious Japanese cuisine to delight your senses. Each dinner we provide is part of a very formal selection of Japanese dishes that varies seasonally. Each dish is made with only fresh, seasonal food prepared daily. 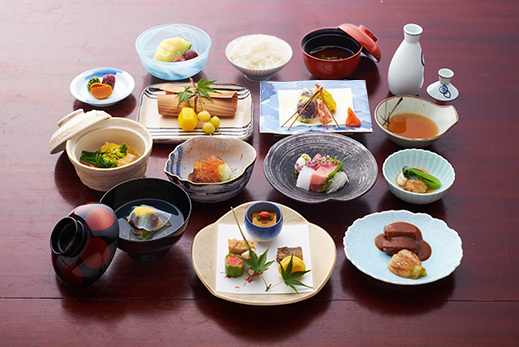 A traditional Japanese breakfast is always served. If you are a vegetarian or have any allergies to meat, eggs or even fish, please let us know what you cannot eat by e-mail, when you make a reservation. 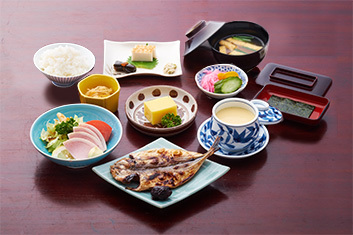 There is not many dairy products in a Japanese diet, but we would appreciate if you inform us of your any special requests, in detail, beforehand. The dinner selections for this current month. We serve dinner in your room (guest rooms) for your convenience and to ensure your privacy. If you are in a group of 12 or more people, you may use our traditional dining halls for dinner. The halls, Jindai-kaku and Bansho-kaku, are made with highly-regarded Japanese cedar and “keyaki” (zelkova tree), and have been used for various historical events. - Please notify us if your arrival might be delayed. preferably at least 2 days before your arrival.